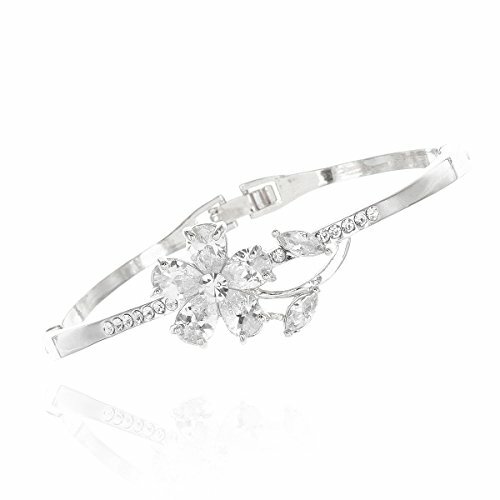 Look and feel exceptional with our Wedding Bridal CZ Single Flower Bracelet in White Gold Plating. The timeless blend of white gold plating and clear cubic zirconia crystals creates the perfect glam look for any occassions. The bangle style bracelet has two hinges which makes it easy to put on or take off. A great gift or a beautiful choice for a new bride or bridesmaid. MATERIAL: Bracelet features 14K White Gold plated backings and Grade AAAAA Marquise Cubic Zirconia Crystals. STYLE: Delicate cz crystal line the front of the bracelet. Side hinges allow free movement while the fold over clasp closure makes taking it on and off easy. This charming bracelet will add just the right sophistication and glam for yourself or gift giving! TYPE: Great for formal event, gala, church, dressing up, wedding/bridal party jewelry gift, birthday party, gift giving, special occasions, Valentine's Day, Mother's Day, Anniversary gifts, Proms, Parties, Bridesmaids, Mother of the Bride, Formal Parties and more!